Click the photo above to grab your copy of the Mariele Cardigan. On Sale thru February 8, 2018. No Coupon Code Needed. First, a little info about the Mariele Cardigan! 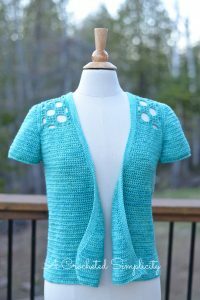 If you love lightweight cardigans for layering, then you’ll love this design! 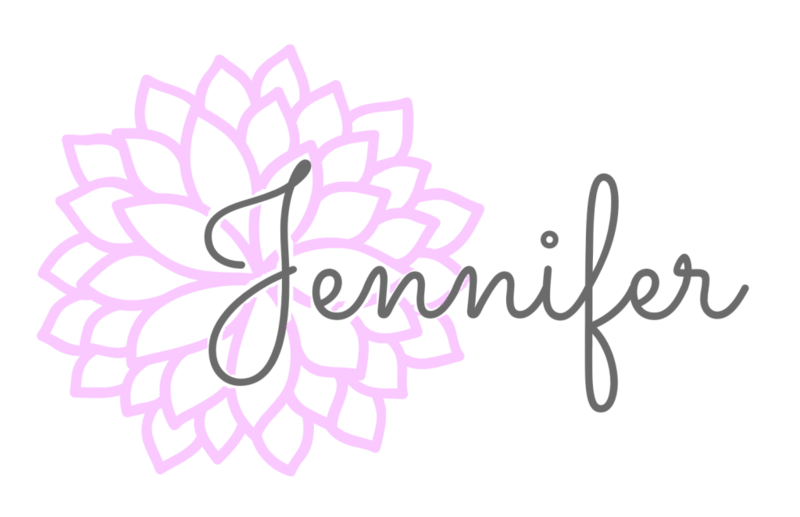 If you love short sleeve, 3/4 length sleeve, or long sleeve cardigans, then you’ll love this design! If you love asymmetrical fronts or straight fronts, then you’ll love this design! This pattern includes all of the above mentioned options! 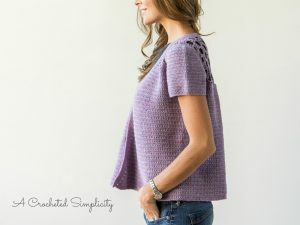 If you’ve been following my designs for a while, by now you know that with each new design I try to incorporate a new technique, stitch pattern, or design element. Doing so helps to keep me excited about the project and I find I end up with fewer WIPs this way. 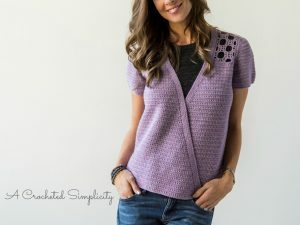 😉 For the Mariele Cardigan, there are a couple things ‘new to me’ (or my designs), for example, the openwork motif back & shoulders, and the easy sleeve construction I developed to make it easy to begin with a shaped cap and grow your sleeve from there. *If you’d like to make it longer, you can! 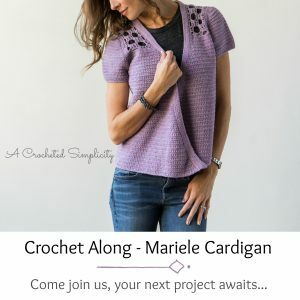 The sample shown in purple was crocheted using Cloudborn Fibers Merino Alpaca Sport (color Amethyst Heather) (50 g / 137 yards / 80% Superwash Merino Wool / 20% Baby Alpaca). Testers also loved Knit Picks Brava Sport for their cardigans! For another sample that I made for myself, I used Madelinetosh Pashmina Sport. *See the photo at the bottom of the post. Yardage ranges from 1,200 – 2,300 yards depending on the size and sleeve options you’re making. A complete chart with sizing and yardage is included in the pattern. 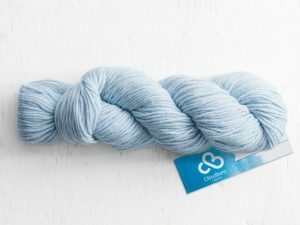 Yarn Sale Alert: Save 50% on Cloudbourn Merino Alpaca Sport! 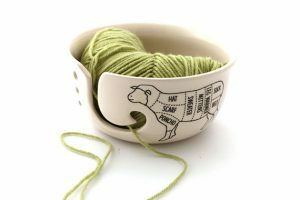 This yarn bowl is one of the great prizes you can enter to win! Step 1: Click HERE to purchase your own copy of the Mariele Cardigan. The pattern is On Sale thru February 8, 2018. No Coupon Code Needed. Try out a Clover Amour hook for your project, they’re awesome hooks! February 9 – 15: Gather your supplies! Choose yarn from your stash, order the perfect yarn, or visit a local store! Post a photo of your yarn to your Ravelry project & add one to the weekly post in the ACS Facebook community group! February 16 – 22: Let’s get that gauge down! Make the openwork motif gauge swatch and perfect your gauge. Post a photo of your gauge swatch to your Ravelry project & add one to the weekly post in the ACS Facebook community group! February 23 – March 1: Complete the motif sections (back and both shoulders) and motif panel edging. Post a photo to your Ravelry project & add one to the weekly post in the ACS Facebook community group! Block your motif panel to the dimensions listed in the pattern, if desired. Find my complete Blocking Tutorial HERE! March 2 – 8: Complete the sections labeled “Back Panel, Front Left & Right Panels, & Both Panels”. Post a photo to your Ravelry project& add one to the weekly post in the ACS Facebook community group! March 9 – 22: Complete Body of Cardigan. Post a photo to your Ravelry project & add one to the weekly post in the ACS Facebook community group! March 23 – April 5: Complete your Front Edging. Post a photo to your Ravelry project & add one to the weekly post in the ACS Facebook community group! April 6 – 17: Complete your sleeves. Post your final photo to your Ravelry project & add one to the weekly post in the ACS Facebook community group!!! Step 1) Create a project on Ravelry linking to the Mariele Cardigan listing. How to create a project on Ravelry: Log into your Ravelry account, then go to the Ravelry listing for the Mariele Cardigan, in the upper right corner you’ll see where it says “add to favorites, hook it, share this” etc.. Click on the little crochet hook and the words ‘hook it!’ (see photo below). A small box will pop-up (as shown in the photo below). 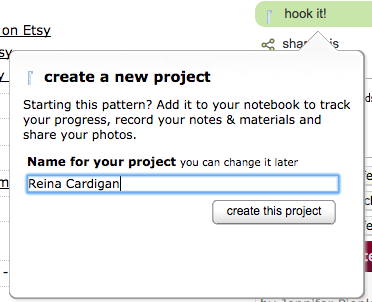 The default name for your project will be Mariele Cardigan (you can re-name it if you prefer). Once you’re happy with the name, click the ‘create this project’ button. Step 3) Add one photo (or a link to your Ravelry project) & your Ravelry username to the weekly CAL post in the ACS Facebook Community Group. All those who have updated their projects & added the info to the weekly post by the deadline will be put into a random drawing for the current week’s prizes. Winners will be announced in the Facebook group on Fridays. Swill this pattern be ok for a “seasoned beginner” that has never made a garment only blankets and scarves? Kinda nervous I will not understand, also I am a left-hander. The colors are so amazing! Especially the teal! And of course the pattern is awesome! I would Live to make this simply because you chose my favorite color Purple! I have made some clothes but am always unsure of my product compared to others!